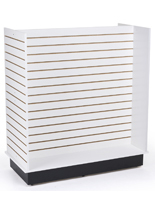 This slatwall display comes in a unique H-shaped design that will provide you with maximum flexibility when configuring your store fixtures. 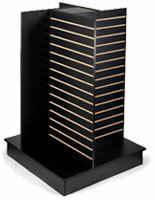 Each slatwall "H" display comes with four walls of display space along which you can arrange any number of accessories. There is a double-sided, 48" x 48" slatwall panel in the center, and two single-sided panels on the ends. Each slatwall panel can accommodate a variety of slatwall accessories, including shelves, baskets, bins, literature holders and more. These accessories easily hook into panel grooves on each of the four mounting surfaces in just seconds. 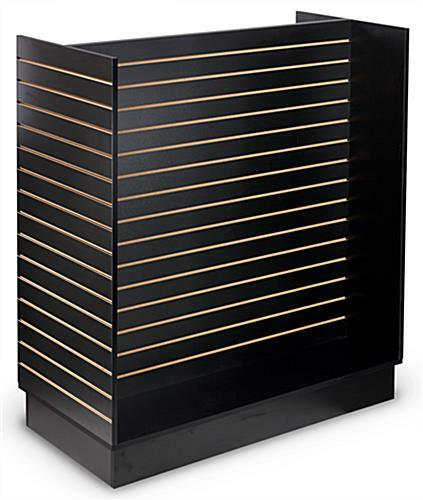 This allows you to create a completely customized retail display in no time at all! With such a versatile display fixture as this slatwall "H" display, you can change around your products and promotions as often as you'd like. 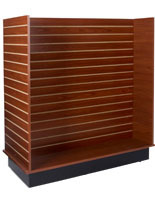 With its unique shape, this slatwall "H" display provides a large merchandise display area without taking up much floor space. The entire slatwall fixture is just 49 ½"w x 54"h x 24"d, but you get about 48 square feet of display space! Literature holders and brochure pockets attach easily to hold posters, flyers, and other printed materials, while hooks, faceouts, and bins are great for displaying merchandise items. 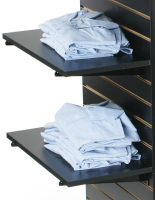 Use your slatwall "H" display to hold clothing, food products, samples, or anything else you can think of. Because it is so convenient and easy to use, a display fixture like this slatwall "H" display is a popular choice for busy retail and grocery stores. 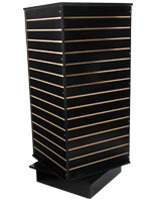 This slatwall "H" display is constructed of black particleboard panels and a 6"h black base. Unlike some of our other fixtures, this slatwall "H" display does not come with matching black insert strips for the insides of the grooves. This means that you will be able to see the wood-colored particleboard inside. 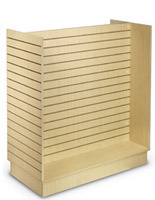 Please Note: Accessories are NOT included with the purchase of this slatwall store fixture. 49.5" x 56.0" x 24.0"
24.0" x 48.0" x 48.0"